Happy New Year friends! I hope you’re enjoying 2013 already! I’m sorry for being MIA recently. Between organizing the children’s Christmas presentation at church, making tons of homemade gifts and our whole family battling through a never-ending cold, it has been an eventful few weeks. All that to say, that despite the craziness I am one incredibly blessed woman. I was so thankful to have get-togethers with most of our families (even my cousins from New Zealand and South Africa) and I am now looking forward to what this year may hold. 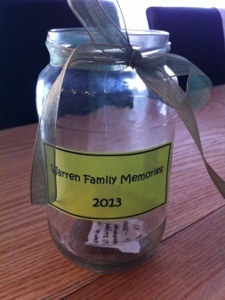 One way to capture some memories throughout the year is to have a memory jar. We did this in 2012 and then went through the notes after dinner a couple nights ago. 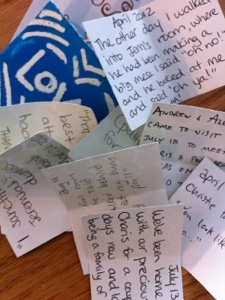 It was so much fun to remember funny things that were said or special moments that were experienced. I just made a new label for 2013 so we can start the fun all over again. This is a quick craft and the benefits are boundless. If you decide to do this too I hope you enjoy making memories and documenting them with your family this year!